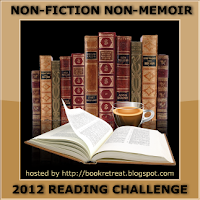 If you're participating in my Non-Fiction Non-Memoir Reading Challenge for 2012, you can post your reviews in the linky below throughout the year. This linky is also accessible through the Challenge Page (see tab up above) along with details about the challenge and a sign-up linky. Be sure to sign up for the challenge before adding reviews to this review linky. Thanks!